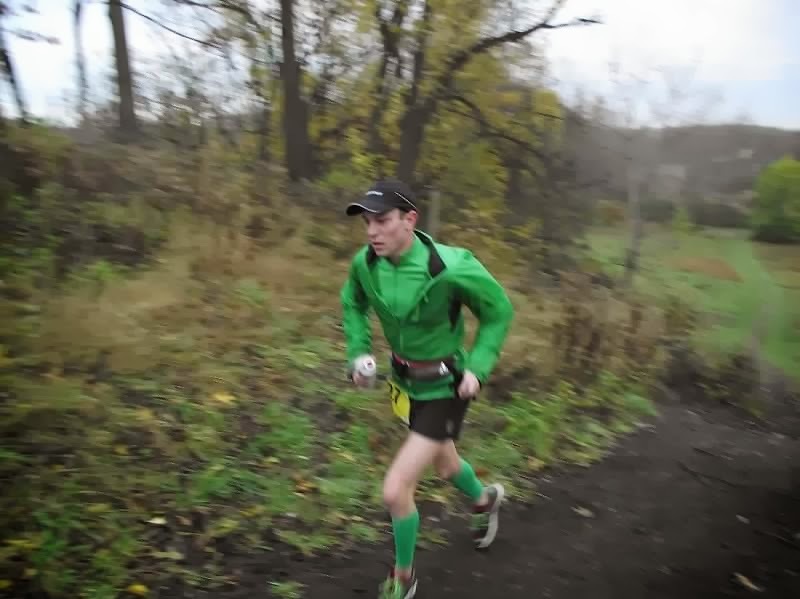 In a couple of days I will be running the Mendon Ponds 50k on Nov, 2nd to ensure I keep my lead in the USATF Niagara Ultra Running Series Points standings. 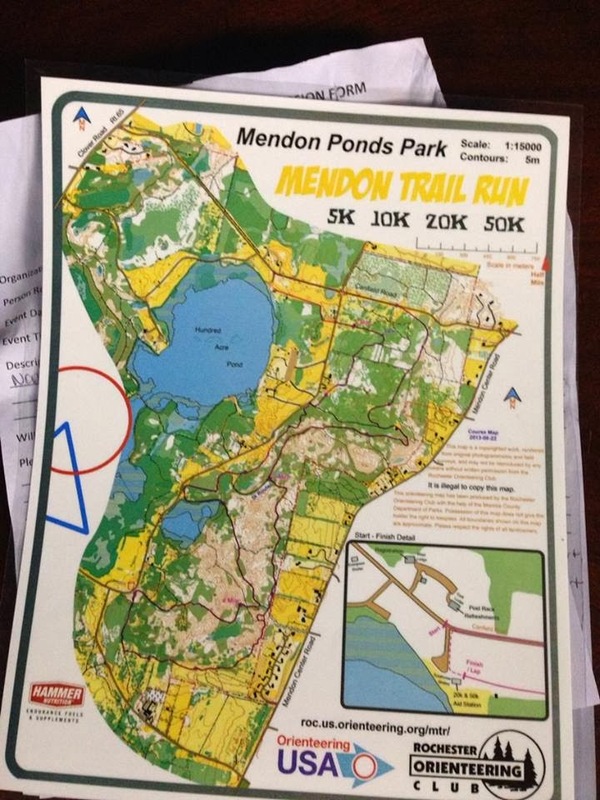 "The online registration for the Mendon Trail Runs is SOLD OUT for the first time ever. The 50K has 133 pre-registered entrants... Double WOW. The 20K has 82 pre-registered; the 10K has 63 and the (longer than) 5K has 18 signed up. 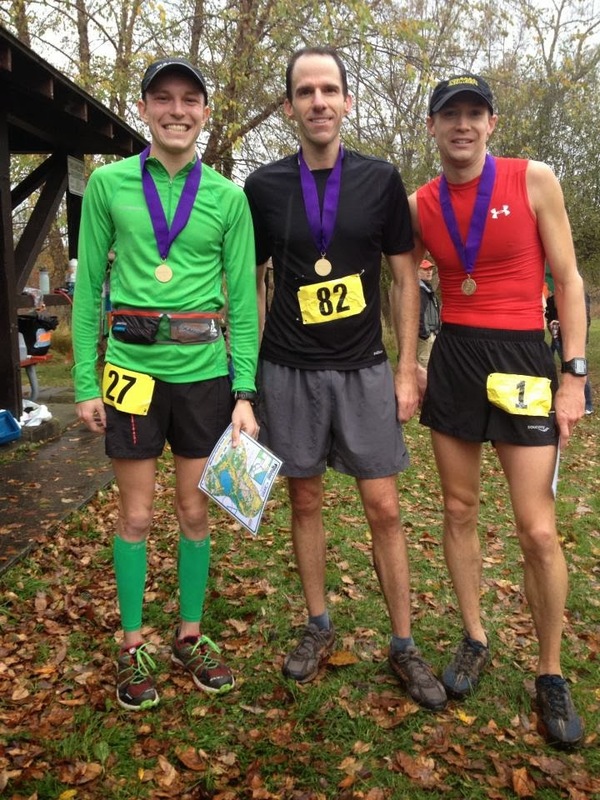 The 50K has some real horses: Cole Crosby who won Virgil Crest and Can Lake (both 50 milers in new course records), Daven Oskvig (Mendon 50K record holder), Jim Sweeney from Albany (frequent ultra winner). Local stars Phil Nesbitt, Ed Housel, Ted Thull and GRTC President Wilt Alston (in what we believe will be his first ultra) are in the field"
This event is turning out to be historic and I am so lucky to be apart of the history. 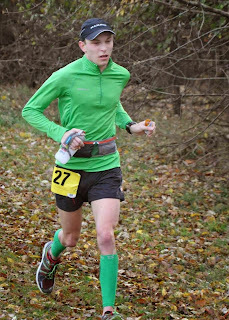 I do not know how the race will play out on Saturday but with it being my last ultra of the year for 2013, I might as well go for it. What do I have to lose? The race is over and let me tell you my legs are feeling it today! It was a hard fought race where the pace we went out in was under 7 minute pace at many points. I kept that pace until my GPS watch died around the end of Lap 2 into Lap 3. The race course was actually deceptively challenging. The continuous ups and downs really got to you by laps 4 and 5 of the course. 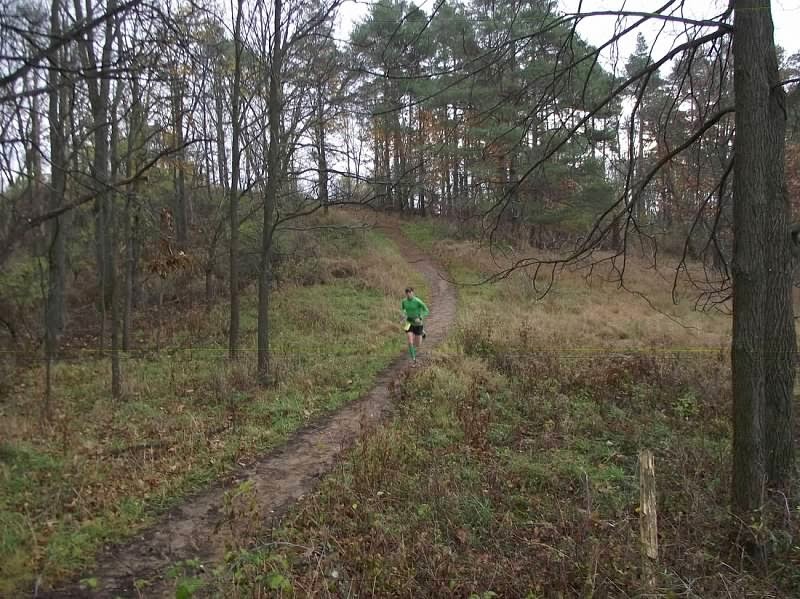 The course being a lovely wooded section with hardly any roots and great trail conditions made for a fast day out there. The rain towards the end did in fact take away from quick foot speed but by that point, I think everyone was ready to finish like myself included. 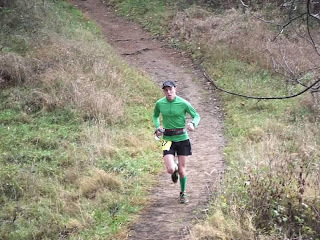 I had a great time running a 50k which in comparison to a 50 miler is much different than going that additional 20 or so miles in a 50 miler. 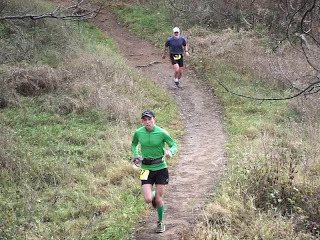 The 50k race started out hot from the get-go with Daven leading the way. I hung behind assessing our pace and just having fun. At times my watch would read 6 minute pace and other times we were near mid to low 7's just depending on a hill or a downhill or flat section. We were running strong. I felt fairly fluid throughout the run. We kept pace for the whole first loop. Myself running a second or two behind Daven. I wanted to see the course so that I would not get lost or confused later on when I knew I would be tired. 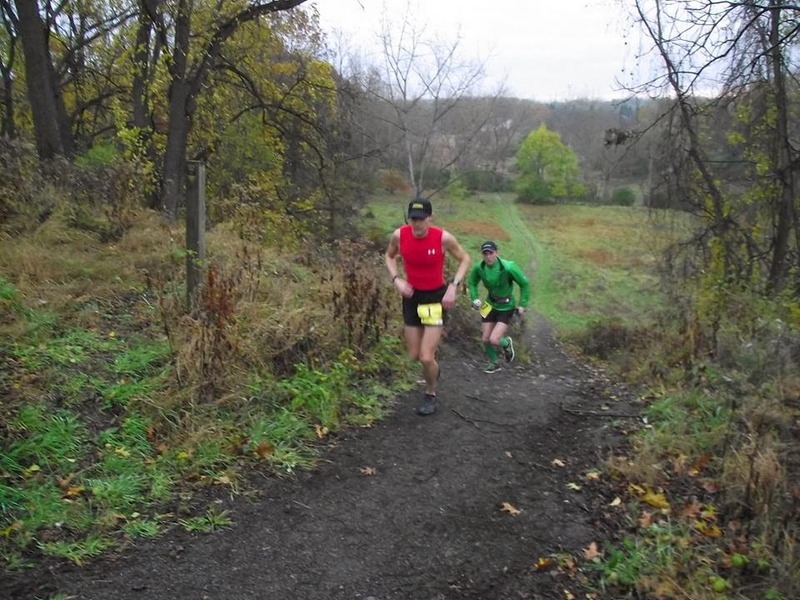 We went through the first 10k aid station point and then continued on lap 2. Somewhere in Lap 2 we continued to run together and with our blistering 6 minute range pace even on the uphills and then by about mile two in lap 2, I caught even with Daven and then kept going at that fast pace. Ready to take my Jacket off! Loop 2 at this point in the photo, I had kept going at that fast pace and just focused on being relaxed. I knew I was already primed to run well so even I was going to tank in the race, I was going to be happy with my performance regardless. 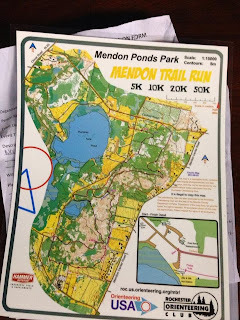 The winding trails of Mendon were a lot of fun. 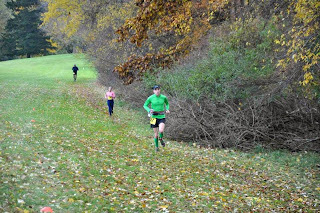 The uphills were a challenge later on in the race and the cool weather I think allowed for me to run quick as I enjoy colder weather. The rain made it even cooler on the last loop. And so the games begun. 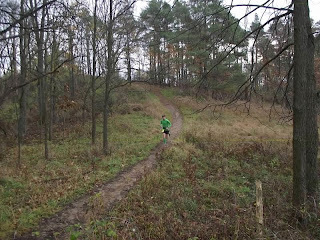 I was running relaxed going up and down the hills of Mendon. 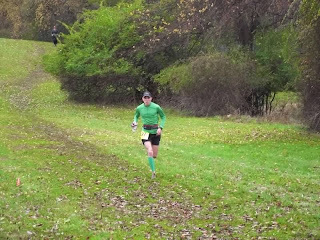 *By Loop 3, I was in a rhythm except for the fact that my GPS watch died in the second lap past the 5k aid station. I had no idea what pace I was running so I was running quick. I took my gels at this point to get some calories and sugar going and my stomach was actually a little off this run. I had some indigestion from the Hammer Heed which I do not totally love but I fought through it. At this point, I was starting to feel the beginning signs of fatigue but nothing too tough. I also was not enjoying the fact that it was a loop course and I still had 2+ more loops to go. By Loop 4, the saying goes "The wheels have come off the bus". I was fatigued. From the 20 mile point to the 31 mile point, my legs had enough. I was not running downhills fast and efficient. I was clopping and having loud footstrikes. 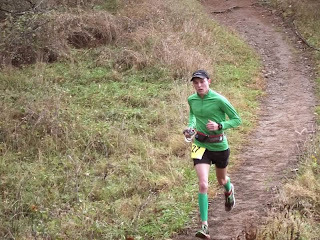 I used gels to help keep me going and man I got really hungry this loop too. I was ready for an aid station to manifest a yummy cheeseburger. It was during this time that I thought of all of the hard work that has been put in to get myself to this point. I think of myself as an average 25 year old: going to graduate school, trying to figure out life. My only difference is I love to run and run I shall! This Fall has been a culmination of hard work. 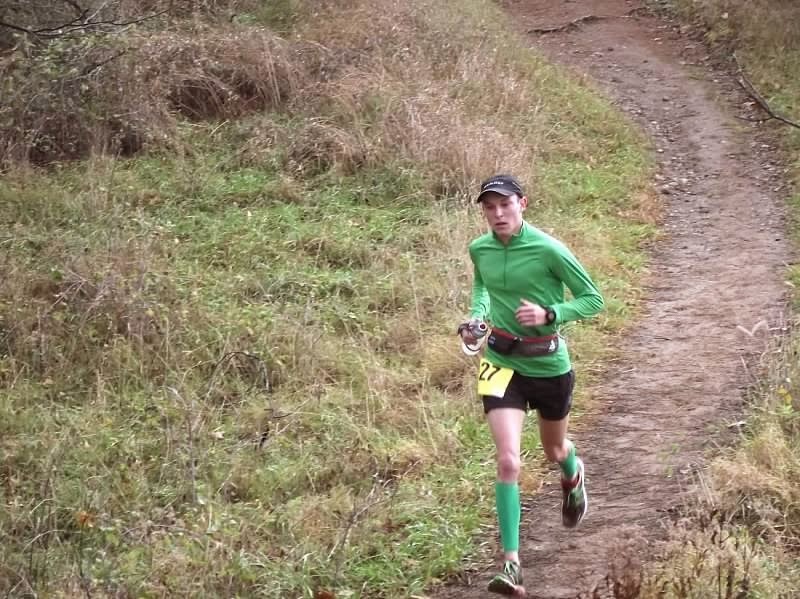 Getting into Ultra running, I never thought I would be able to thrive in the sport so quickly but I have just listened to my body and been as smart as I could on the day. Here I was on my fourth lap of a 50k running under course record pace after running both the Virgil Crest Ultra 50 miler in end of September, the Can-Lake 50 in October 12 and two weeks later a 50k. I would not do this again in terms of race running. I did not have enough time to recover and then train to build fitness again. You need at least a month for that training to increase your performance. Loop 5, I lost tons of time in the race. I had trouble powering my legs on the ups and the downhill sections I just managed a crawl. I was running ok but my early pace had finally caught up with me. And with 6 miles to go, anything could happen. The rain began to fall and I was like NOOOO! By this moment, the trails were a little muddy and you had to be a little cautious on the descents. I stopped at the last aid station to drink some water and power it home. Those last three miles I think I actually started to feel better. 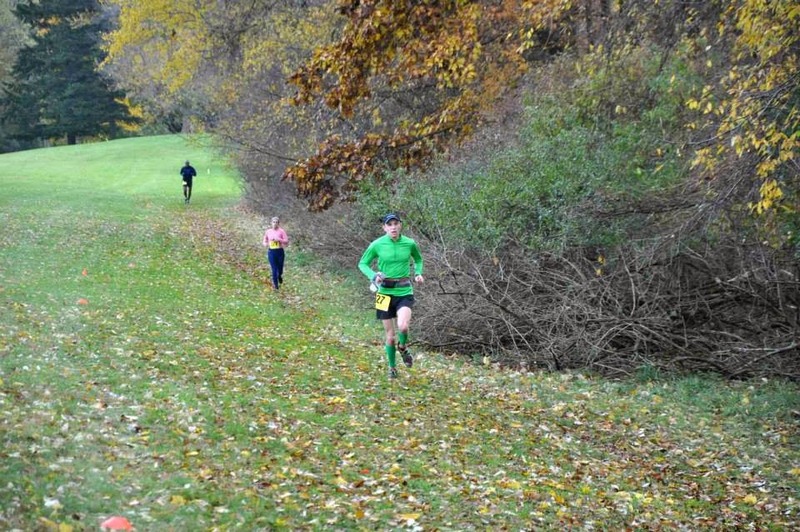 I knew I was about to finish and my legs responded a little better than lap 4. I hit the final section of trail heading across the road and into the finish. I knew I had the race and kicked it in like it was a 5k. It felt great to cap off such a season! THE FINAL KICK TO THE FINISH!!!!!!! With this finish I came in at 3:41:55 under the 3:52 previous course record. 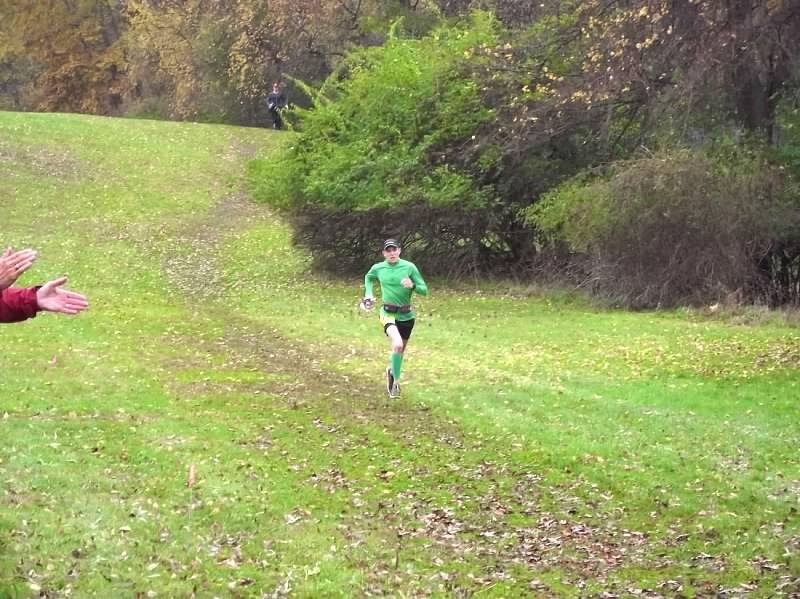 It was an incredible year and Fall season of running. I never thought in my wildest dreams I would be able to get myself this fit. 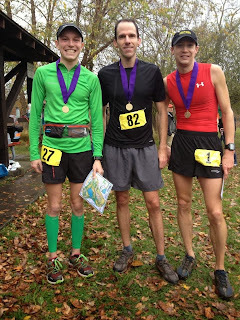 I won the USATF Niagara Ultra Running Series with 351 points which I think might be the highest point total to date. Now I have to wait to get a sweet winner's jacket in the upcoming weeks. And what is exciting is that I still have tons of time to build and grow. 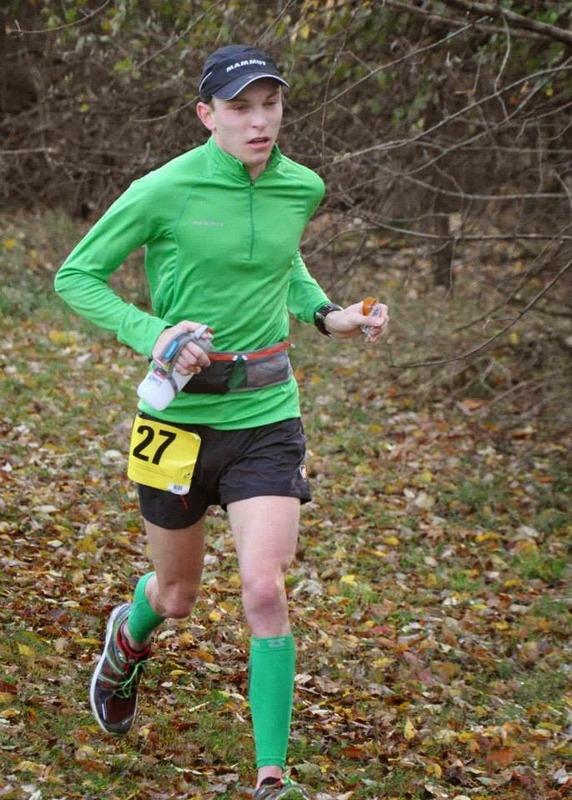 I am brand new to Ultra running and this year has shown some success and I cannot wait to build on it for 2014. So what it comes down to now is what do I do next? Well, for starters, I am going to take some time off and just enjoy running. 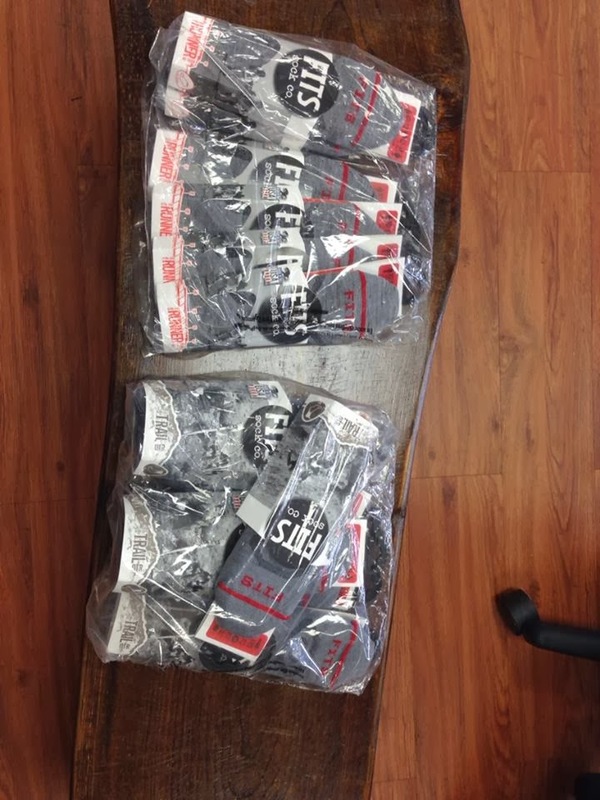 Build that base and get ready for snowshoe season. Might I do a turkey trot for fun, yeah why not! I can say that it has been a great journey and I really appreciate all the support. I would love to have everyone voice their opinions on what races I should place on my calendar for 2014. 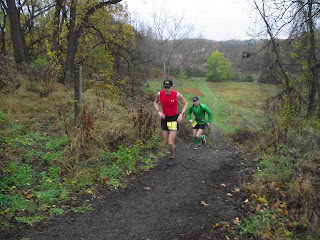 I am looking for 2-3 High Profile 50 milers for 2014 with some space inbetween them. Here has been some of my thoughts so far. I have other races of interest such as the Adirondack Marathon, the ADK 80k, Manitou's Revenge, Stonecat 50 miler. 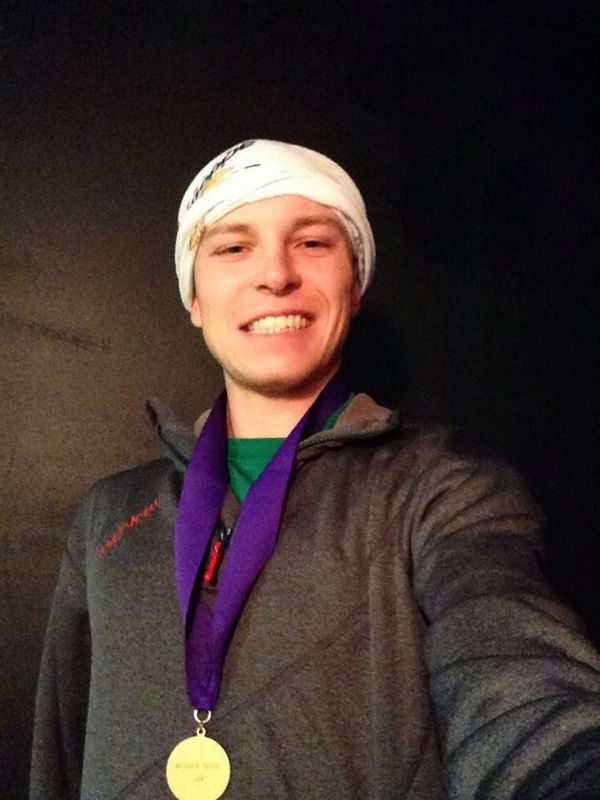 If you have any suggestions of races you would like to see me at, I would love to hear your thoughts! Thank you to everyone at USATF Niagara, New York Ultra racers, Mammut, Acidotic Racing, Karhu, Craft, Fits Socks, Dion Snowshoes and Confluence Running/Finger Lakes Running for giving me the support and time to have an incredible year! Thank you to my father, my family, and my love and inspiration, Ashlee Prewitt for all the support she gives! The prize for finishing a cool map of the course! 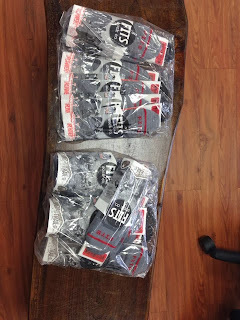 My birthday present, bundles of socks!!! 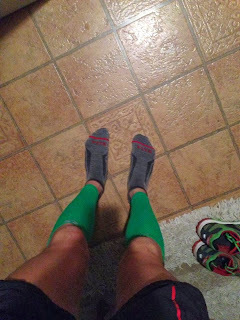 Race Ready: Zensah Green Calf Sleeves, Mammut MTR 201 Pro, Fits Ultra Light Runner No-show, and MTR 71 shorts! Here are some more photos provided from the event!!!!!!!! !